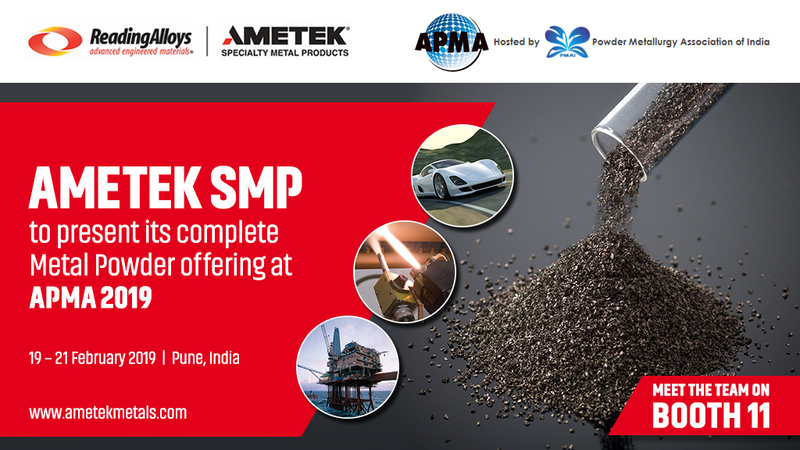 As a leading manufacturer and global supplier of water and gas atomized metal powders, high purity titanium powders and high-quality master alloys, AMETEK SMP is serving the fast-developing Indian market across the spectrum of applications – thermal spray, metal injection molding and sintered metal filter powders. Industries supported include automotive, aerospace, medical, and oil and gas. SMP Eighty Four, a global leader in stainless steel high alloyed powders, has an enviable reputation for manufacturing unique advanced alloys that can be customized to meet the specific, exacting demands of its customers. In particular, the company is experiencing strong demand from India’s automotive industry for its 409L and 434L as well as 304L and 316L alloy powders which are used in the manufacture of the stainless steel exhaust systems required to meet stricter emissions systems. Reading Alloys is at the forefront of titanium powders and gas atomized powders. Its continuous development of titanium powders has enabled the company to expand into new markets, such as coating powders for orthopedic medical devices and advanced electronics. An extensive range of master alloys complements the product offering from Reading Alloys including vanadium, molybdenum, chrome and niobium alloys. As key raw materials in the production of titanium, these products are used in critical aerospace, defense and medical applications. Investment in India by AMETEK SMP has been growing in recent years and an expanding team of direct staff in the country is supported by a network of agents and stockists for its wide-ranging powder business.